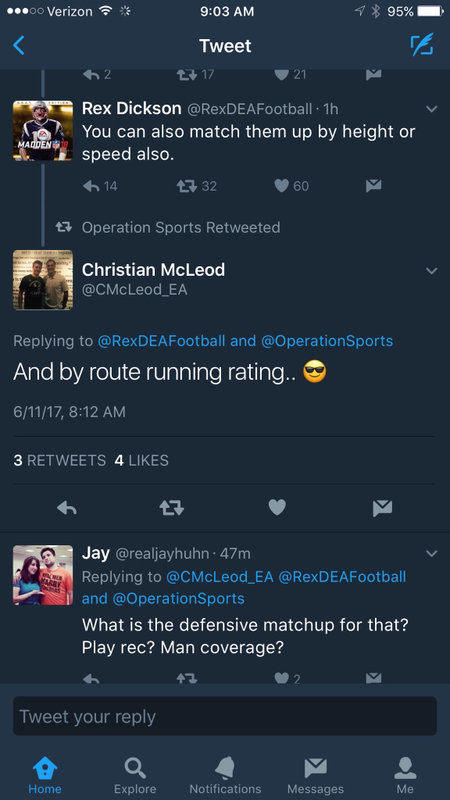 Steve reported on Twitter that you can match-up players in defensive coverage by overall rating in Madden NFL 18. This means that your top rated CB will match up with the top rated WR from the other team on defense. There’s also other options in coaching adjustments for defense to auto-flip your defensive play call, playing ball in the air defense, option defense, and your pass rush. No word on the available options here other than the ones shown. Update: Clint Oldenburg chimed in on Twitter to give a more detailed list of ways you can match up with cornerbacks. Included are height, speed, jumping ability and more. A good step in the right direction. Was hoping for something more akin to NFL2k's system that allowed you to customize specific matchups across the board and designate double coverage when the playcall permitted. Example: Having a linebacker spy the QB, a SS key on the TE...or your speedier (not necessarily your best) corner and their fastest wr. This was awesome when an opposing wr taking the game over and you could designate double coverage to shut him down. Good times. A good step in the right direction. Was hoping for something more akin to *NFL2k's system that allowed you to customize specific matchups across the board and designate double coverage when the playcall permitted. Example: Having a linebacker spy the QB, a SS key on the TE...or your speedier (not necessarily your best) corner and their fastest wr. *This was awesome when an opposing wr taking the game over and you could designate double coverage to shut him down. Good times. Holy wow... like, Kanobi of 2k5 advocating on MaddenMania fame?!?! I am a bit pessimistic about this. I can see guys in Franchise signing high overall but bad players (see 78 speed regression candidates) just to exploit the highest overall matchup. Hopefully there are more options, as overall is one of the worst ways to rate a player. Man you took me waaaay back. lol And I believe it was NFL2k3 that I was posting about all over MaddenMania. I couldn't believe how far ahead Nfl2k was at the time and had to spread the word because, like me, a lot of 'Maddenites' (the term I used back then haha!) were in the dark on 2k football. This wasn't my way of adding matchups in, there are so many variables besides overall that determines a good matchup. Unforutnely, when competitive gamers just say best on best, this is what happens. I am hoping we get manual matchups or a lot more options, no way of knowing now so I'm gonna reserve the rest of my judgement until then. Same. It's always said "OVR doesn't matter" so hopefully there's more to it like individual assignments and maybe an nickelback position specific to the depth chart. My initial thought was the other options would be "By Speed, By Height" or "By MCV, By ZCV" and along those lines. But wait and see. My biggest question as always is whether or not the CPU will use all of them and if they do how smart they are when doing so. I didn't play NCAA14 so I'm not sure if the AI utilized them but this seems like it would fall under the same category as packages which I know they don't utilize in Madden. More interested in what the pass rush option does. It can be sorted by a height, bunch of ratings and more. Not the way I wanted to see it implemented, but I guess this was the only way they could do it without causing shenanigans like my OLB moving to SS. But I was definitely hoping for something far more in depth. I would like to be able to have my number one corner follow a guy as long as it is X or Z, but I don't want my top corner following him to the slot. With the way they have implemented this, I don't think it can be expanded on. All in all more disappointed than happy. Great addition.... But that they announced it as a franchise mode addition is disappointing. Yeah it's not lookong good for primarily franchise guys so far. But of course game play improvements are also franchise improvements so there is a brightside. We all know that OVR doesn't mean much, especially in online CFM's where you always have a few people who like to spam their stud rookies. For instance, why would I want Kevin King (Who will be a top 3-5 CB by year 3) defending an 88 speed 97-99 OVR Julio Jones by year 3 or 4? When that same guy probably has a 6-2-6-5 95ish SPD 82-85 OVR young WR he throws to more? Makes no sence. Is this a step in the right direction? Sure, but it's far from perfect. I would at least like to see them, along with the best on best option, add a fastest vs fastest choice, along with a choice to match depth charts. So the #1 CB on your depth lines up vs his #1 WR, and so on. Step in the right direction. Not perfect, but at least it feels like something new. U might've missed the tweet a few posts back. U can go spd vs spd, ovr vs ovr, height vs height, etc. nobody knows all options, yet, I would imagine. But, looks like spd vs spd is one of the options. I'm glad HEIGHT is one of those options that you can select other than OVR. You could have a 90+ OVR CB that is 5'8 go up against an average WR that is 6'5 and that corner is getting beat almost every time, ESPECIALLY in the Red Zone. I disagree. I believe this does make a difference within franchise mode of how you draft or build your team. I'll use an example of how the Eagles drafted Rasul Douglas in real life at cb. His size and physicality can be a factor against dez Bryant and brandon Marshall within the division. Maybe not the important Cfm feature you were looking for but it is a nice addition. Really hoping it's a bit more open than this because I can already see a lot of issues with just matching certain attributes both from a user and AI standpoint. Direct assignments would be best, by depth chart option would be next best option. Hopefully this is something they will detail in a blog. I'd be very surprised if route running wasn't matched up with the best m2m cover corner. Yeah, I'm not sure. I definitely agree with who he replied to saying that MCV should be an option but if it has to match up with another attribute then it limits things a lot. There are tons of variables when it comes to SPD, AGI, RTE, MCV, ZCV, Play Rec, etc. The Defensive Assignments that were implemented in Madden 2005 would be great for all that and could even been integrated as a part of Game Prep in CFM as well. Looks like really good feature just disappointed it is part of cfm addition. I think this year they're really focusing on gameplay. I'd rather have amazing gameplay and a mediocre franchise then an amazing franchise and mediocre gameplay. Franchise's time will come, I think. I'm assuming the default setting is overall? Cool addition but it isn't CFM, so they managed to take a lot of hard work, misrepresent it in the build up, and make people angry. It also isn't actually what we asked for, which would've made it more palatable. If they were really catering to Franchise players who might take the time they could've added actual custom matchups, like we wanted. This is more for online/competitive/UT guys who want to be able to make one adjustment in about 5 seconds and get some result. So yeah, cool addition I guess, it is actually something I'll use, but calling it a Franchise improvement is not going to make me (a mostly exclusive Franchise player) any happier about how we're getting even more ignored than usual this year. I've been out all weekend. Has all the information about FM and the game out in in blogs/interviews already or is there just rampant speculation that certain parts of the game were dumped on or left out? I'm trying to find the links with blogs and interviews. The only first-party blog that's come out from EA was for the 3-v-3 MUT Squads mode. That blog was released well before EA PLAY started, sometime this past week. The last word on CFM I saw on Twitter was before I left John White said he couldn't say anything on CFM, yet. I was thinking, by the sounds of this thread, that silence was broken. We know that off the ball injuries and a draft board are in. Since Coaching Adjustments can be used across the modes, many are upset that the feature is being categorized as a CFM feature and, as one would expect, they feel slighted. Confused by this. What do you mean "Cool addition but it isn't CFM"? Are you saying it's not in CFM? Cause it is.. Confused by your comment. It's also a welcomed addition because too many times I've seen the AI match up the wrong defenders on receivers, like putting a 5'9 CB on a 6'5 WR, etc. This is also a feature that has never been in the game before so it is a new CFM addition. Maybe I just don't understand the hate. This is also a feature that has never been in the game before so it is a new CFM addition. The other adjustments haven't but specific to coverage assignments it was definitely in the game from 2005-??? on the Xbox/PS2 era Madden. I don't remember being able to match up a CB with a WR based on OVR, Height, etc., in previous editions of the game. This is the change i'm referring to. Were we able to do that before? 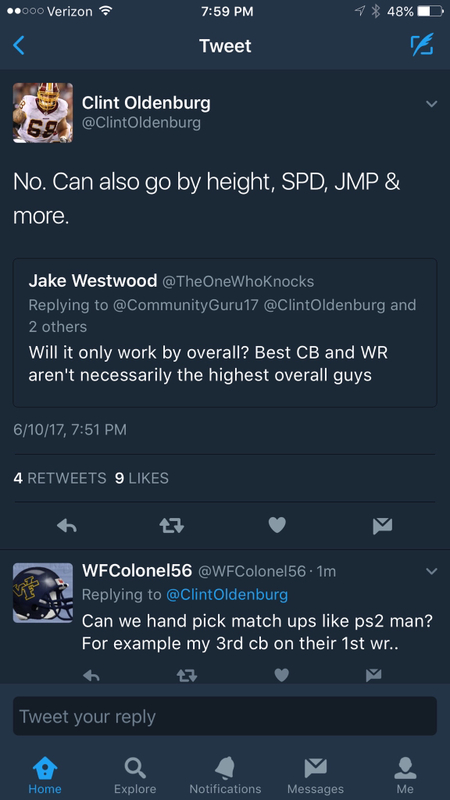 Clint confirmed on Twitter that draft boards are in CFM. Another needed want from the community. This is a good move in the right direction but I'm weary that it will just be another thing that isnt implemented to it's full potential. Why not simply before the game/pre-training screen where it lists the opponent's biggest offensive threats, give us an option to assign our DBs to their passcatchers and lock it in for the week ahead? Literally show a list of my players and then with a dropdown next to it select the guy they should shadow. My biggest DB may not be the guy to cover Julio Jones, perhaps my best OVR DB is really short better at covering the slot? Unless there is a huge lot of criteria to choose from or manual assignment, this won't provide the flexibility it could have. If you wanted to the availability was there. You basically had the freedom to match up any corner on any WR. If you wanted SPD on SPD or Height on Height, you could do all that. It wasn't nearly as simplified into a button press like this is but the availability to do so was all still there. I'm hoping this allows for all of that as well. My biggest DB may not be the guy to cover Julio Jones, perhaps my best DB is really short but fast? Unless there is a huge lot of criteria to choose from or manual assignment, this won't provide the flexibility it could have. Exactly what I want. I want a gameplan screen in the franchise front end where we can set the gameplan, strategies, etc for the coming opponent. And the ingame adjustments should not be nearly as in depth. But that pregame menu should be deep as possible to mirror real NFL preparation. Hate to be one of those guys, but something similar to NBA 2k's gameplan feature would be great. where did you hear about draft boards? It's been confirmed by Clint in an interview that it's in. NCAA had this feature some years back (not the matchup); the ability to globally change how your defense played the ball in the air, or went for strip tackles vs conservative, rushed the passer, etc. -- can't remember the exact year like 10-11 but I always wondered why it didn't make it into Madden. I like the idea of matching corners but it seems like it would get a little perilous with alignments when it comes to linebackers and safeties. They never could quite figure that part out the last time Madden had the feature in. It's a gameplay addition, not a Franchise addition. It's going to be used by everyone so it isn't specific to CFM in any way. You could call any gameplay feature CFM if you call this that. #1. When we had custom DB matchups before, there was this dude in the NFL by the name of Marshall Faulk, you might have heard of him. I'd corner him up. Usually my #3 depending on what my CB depth looked like. #2. I never matched up best-on-best. I put my best corner on their #2 WR, and double teamed their #1. Can't do that in this system. With respect to #2 - does true bracket man coverage exist in the game right now? I don't think it does, not without some extensive hot-routing at the line of scrimmage, and even then I don't think it actually behaves like bracket coverage. On #1 - I get the impression that the things they wanted to achieve with this implementation of DB matchups is that A) it didn't break the flow of an online game with a pause menu, B) it was easy to understand, C) it functioned predictably and consistently, and D) it wouldn't break. If I recall correctly, the previous system where you could assign individual defenders to individual offensive skill position players was incredibly easy to break. I think going forward more extensive options like we had before might be better served in a more robust out-of-game game planning feature as opposed to in-game adjustments, especially as online play grows ever more prevalent. It was very easy to break. If I recall correctly, it was fine if you simply matched top corner vs top WR, but oh damn if you ever tried to assign someone to the TE it was disastrous. I always imagined the Benny Hill music whenever my LB was at safety or corner. And yeah, bracket coverage is not in the game. I've always been a bit surprised that the community doesn't bring this up more. The game simply does not come close to replicating double coverage. #2 is what the 49ers did to the Cowboys for much of the 1994-95 NFC Championship. I'm surprised that isn't a more common tactic. It is not terribly rare, but I think it should be done more. I think zone is just so prevalent right now in the NFL. Especially cover-3. So, I get the feeling they'd rather have a RCB and LCB that always knows how to play each side of the field. This is just a guess. I also don't think u see as much best v best these days, either. Lol. I'm glad they added it. I remember when Deion used to do that all the time and that made sense back then. I think this is used less, as well, due to more zone D these days. I agree that this as a major part of why they made it how they did which is why I don't consider it to be a CFM feature. Strictly speaking no, but over-under bracket coverage is essentially trail + drop coverage, so a press man corner with safety help in drop zone is effectively bracket coverage. No way to inside-outside intentionally, but that's mostly because leverage doesn't work correctly. Oh there were multiple ways to break it lol. Think what you are talking about happened when the offense was in a twins set or something like that. So my biggest question is can I assign someone to there TE? For Example: Last fantasy draft I did I got Su'a Cravens, MLB. I moved him to LOLB in my 4-3 defense. His MCV is a mid to high 70s. I want him on your TE every play. Not my ROLB who has a MCV of 58. Or my MLB who has a MCV of 42. I want Cravens in the game, covering your TE everytime that TE is on the field. Im wondering is it part of this feature though? I mean I know we really dont know much of anything. But I would really like to be able to do this, through this feature. I hear him say that you can press TEs, but I didn't hear the part about matching up with them with specific players in coverage.